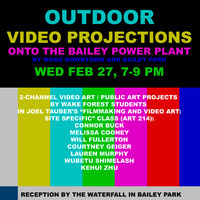 Wake Forest students in Joel Tauber’s “Filmmaking and Video Art: Site Specific” (Art 214) class will project their 2-channel video art projects onto the Bailey Power Plant, by Wake Downtown and Bailey Park, on Wednesday February 27 from 7-9 pm. There will be a reception at that time by the waterfall in Bailey Park. If it rains on the 27th, the event will take place on Thursday February 28 from 7-9 pm. Work by Connor Buck, Melissa Cooney, Will Fullerton, Courtney Geiger, Lauren Murphy, Wubetu Shimelash, and Kehui Zhu will be featured in the event.